You may have seen this story yesterday. It ran on the front page of one of this country's two true news sources the NY Times as well as several other newspapers across the country. The story revolves around Georgia. Georgia is likely the oldest of the dogs confiscated from Mike Vick's Virgina property when it raided early last year. Georgia had won some fights apparently...she has the battle scars to show for it. She was also used for breeding...and at some point, someone decided that her teeth were a neussance so all of her teeth were removed. The Salt Lake City Tribune also ran a great blurb on the Best Friends dogs earlier this week. This, along with the stories of the dogs at Bad Rap are doing a great job of telling the stories of these dogs. Dogs that are victims. Dogs that have every reason to fear and hate humans and yet don't. Dogs that have a fierce reputation, but in spite of being the small minority of dogs that are actually "bred and trained" to fight, are affectionate and yearning for love. I just recently stumbled across a new blog out there - Cruelty is a Crime. Written by a former Chicago area police officer, he has a lot of great insight into HSUS, animal cruelty and other animal abuse related topics. I'm looking forward to keeping tabs on this one. Enjoy. A week or so ago, I posted a little bit of information about a proposed program in Los Angeles that was aiming to use parolees to help train sheltered pit bull type dogs to get them ready for adoption. I hadn't heard much about the program at the time, but there have been several news stories that have come out about it since the City Council postponed voting to approve the program 2 weeks ago. The program would be run by a local not-for-profit group that already works with a lot of parolees who often have a difficult time finding work. The not-for-profit would work with the city to hire parolees to come into the shelters, and work with the scores of dogs that are in their shelters that need some better training to be considered truly adoptable. 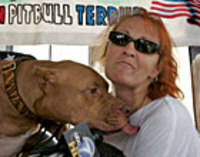 Tia Torres, who is the director of Villalobos Rescue Center runs the facility, that is the largest pit bull training facility in the US -- and "teaches proper, responsible ownership" of pit bulls. Not only has the program been good for the dogs, but not one of the nearly two dozen parolees they have hired for the program have ended up back in prison. Los Angeles killed more than 18,000 dogs and cats last year (which is very low for a city that size, the KC metro kills roughly 40,000 per year) -- of the 6,541 canines destroyed, 40% of them were pit bull type dogs. There are some concerns about liability for the city partnering with the program -- which is why the council postponed their vote two weeks ago. But if those can be worked out, it sounds like a fabulous program that would benefit the parolees and the dogs. "Its abundantly clear that we cannot pretend to aspire to a no-kill (city) if we don't try harder to reduce that killed pit bull rate," said animal services GM Ed Boks. It's this type of out-of-the-box thinking that is leading to many areas to create some really great programs that are helping animals...and people. 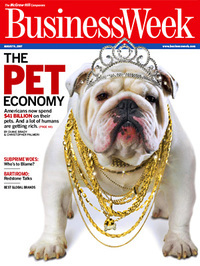 This week's edition of Business Week has a great story on the Pet Economy - -the roughly $41 BILLION a year people in the US spend on their pets. There are a lot of interesting statistics in the publication - -42% of dogs now sleep in the same bed as their owners (up from 34% in 1998) and the rise in the use of organic and vegan diets for dogs. There has also been a huge increase in services for pets -- doggy daycares, mobile grooming services, pedicure services, dog walkers and massage therapy. The #1 series on the National Geographic Channel is the Dog Whisperer (Ceasar Milan). There is also now the ability of people to buy animal health care coverage -- an industry that is growing at around 100% per year. Much of the growth of the number of pets (63% of US Households have at least one pet), and the amount of money people spend on them, comes from their popularity with empty-nesters, single professionals, and couples who delay having children -- all groups that have a tendency to have time and resources to spare on their pets. 1) With the growth of the Pet Economy, why are so many cities slow to see the trends and provide more amenities to people with dogs (especially in a place like KCMO that needs to rely on people without kids because their school system is in such disarray)? 2) Why, in spite of 42% of dogs living a charmed life and sleeping in their owner's bed, are we still seeing cruelty and neglect cases on the rise. It seems as if there are two extremes in dog ownership now. 3) If people love their pets so much, why are so many of them finding their way back into our shelters in hopes of finding new homes? Men's Health ranked the United State's 50 largest metros to determine the most dog-friendly areas. Obviously there are flaws to their methods -- as daycare facilities, and pet stores usually follow dog ownership - -so if there are more dogs, there is more demand for their services. Vets, to a lesser extent, follow that same patern. Shelters may actually be a negative - -high demand for shelters means a lot of homeless dogs...which isn't a good measure. But all in all, I have a tough time faulting any of the top 5...all are very good dog communities in their own right - - the top 5 being Colorado Springs, Portland, Albuquerque, Seattle and Tucson. Unfortunately Denver comes in at #6 according to Men's Health. And Louisville came in at 34 -- out of 50-- which is still too high. Again, the rankings seem to never consider stupid legislation such as too-restrictive of pet limits, mandatory spay/neuter, and breed bans that are NOT good for pet owners or the dogs. They also never consider enforcement of animal cruelty, or euthenasia rates. My new quest is to get all of these rankings services to include legislation as a criterion. I don't want cities with irresponsible legislation to be considered dog-friendly cities. And the more people that realize these types of laws and the harmful affects they have, the better off we'll all be long term as people become aware of cities that are chipping away at their freedoms. People also need to be aware of euthenasia rates, and that cities that continue to put down thousands of dogs are not dog-friendly...at least not for the dogs. Education, education, education...seems like there isn't enough of it, and everyone needs it. Meanwhile my home town of Kansas City comes in at number 28...thanks in large part to our huge number of animal shelters (again, is that a good thing?). We're making some progress in terms of dog parks and legislation...but we have a long way to go. Check the entire 50 ranking -- and also, check out the interactive map to see how each city scored on different criteria. There are a couple of more blogs that I've been following lately that are now added to the blog roll. The first is a blog called Dog Tails. Dog Tails is a joint venture of four volunteers at the Give a Dog a Bone Rescue in San Francisco. I must warn you though, that many of their stories are very sad...tis the life of rescue sometimes. The second is a blog called Social Mange. Today is a great day for a first read, as I love the quote from the Baltimore Sun article on DNA testing....that pretty much sums up everything I've typed here in the past 10 months, only in a small paragraph. I guess I'm a bit wordy. You can link to the entire story from her blog too. I still can't figure out how breed DNA testing might work, as so many dog breeds are decendents from other dog breeds that I will always wonder if a Great Dane will show up as a Great Dane in a DNA test, or as a Greyhound/Mastiff mix....and neither answer would really give me much satisfaction. Last weekend we attended and worked the Kansas City Pet Expo. Attendance at the Expo was down as KC is being exposed to mother nature's fury and the expo fell on one of the few nice weekends of the year so far. This is the first Expo we've had since the BSL craziness last summer, and I viewed my trip around the show differently. I talked with dozens of rescue and show people of various breeds at the show, and it was really disheartening. There are thousands of people in Kanas City that are heavily involved in dog rescue and show. So few of them knew much of anything about the discimination and BSL that has been rampant in this city for the past year. One Doberman woman told me how happy she was that the "bad people" had moved onto my breed. I guess there's a part of me that will feel the same way once they move on, but it won't keep me from fighting for those people too (although, realistically, it looks like they're probably moving onto Presa Canarios, which look like gigantic pit bulls, so I may not get a lot of relief from that). Someone at the Italian Greyhound rescue told my wife that they weren't able to get any dogs for adoption for the show -- but that they have "over 20" Italian Greyhounds up for adoption -- in a four state area. 20? In a four state area? 20 is a Monday morning in pit bull rescue, just in KC. It was just really frustrating that of all the thousands of people who dedicate so much time in their lives to animal welfare, that so few have any knowledge about what Breed Specific Legislation is doing to a small group within the animal community. If, as a collective group, we banded together to speak out about what's wrong with BSL, no politician would even dare bring it up. Seeing a line of thousands of dog owners out the door at the city council meeting, all ticked off and vowing to not vote for that politician would ensure that no one would dare bring it up, because it would be political suicide. But too many people keep quiet. I had a good email conversation with Sonya Dias who is working on the most recent legal suit in Denver. She mentioned that she's even struggled with some people who are on OUR SIDE that are voicing opposition to her suite (there is a great "interview" with Sonya over at Caveat for those who want more info...I've been really impressed with Sonya in my correspondence with her wish her all the best in the world. 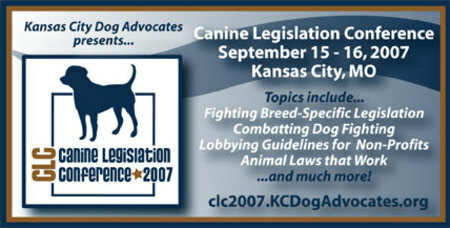 I will spend a little time talking about the legal aspect of fighting BSL tomorrow). It's just really frustrating that as a dog welfare community, we have allowed our voices to become fragmented, and we've allowed so many owners to suffer because of the actions of some of the evil people out there that are either completely irresponsible with their bets, or purposely completely mistreat them. We must work together in the fight -- and make sure our huge group of voices are heard. Loudly, and clearly. It's all our responsibility. A feel-good news story this week about the Canine Foundation in Kansas City buying its second bullet proof vest for one of Kansas City, KS' Canine cops. It takes a lot of years an money to train these canine cops, and often, they're the first ones through the door in major drug house busts. 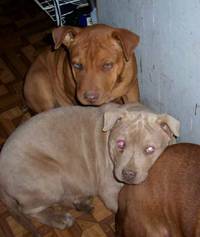 It can be very expensive for cities to have these dogs shot and injured/killed. 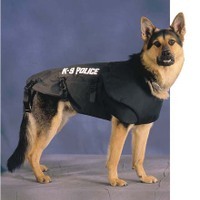 Now, two of Kansas City Kansas' Canine cops have vests. 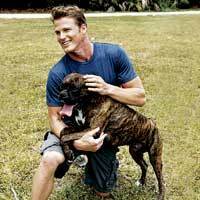 It's a cool project that the Canine Foundation is working on. And I'm glad to know one of their group members. You can watch the news story here -- and you may have to scroll down to find the story -- but it's worth watching. Marjorie and I had a conversation about this earlier this week when I posted about the stolen Yorkies. According to Karen Delise's Book, Fatal Dog Attacks, approximately 1/3 of the fatalities caused by dogs in the United States over the past 25 years have had children under the age of 2 as their victims. 79% of victims are children under the age of 12 (8-12 year old boys are often victims). Meanwhile, in the UK, 17 years after the Dangerous Dogs Act was passed, finally some good advice comes out of the media. "Children Should not Be Left Alone With Dogs". I had a city council person ask me a while back if I would trust my pit bulls alone with young children. No. I would leave any dog alone with young children. I'd also like to note, to back up our point about muzzling being useless and people being concerned about people out walking their dangerous dogs, over 75% of fatal attacks in the US are by chained dogs, dogs in their back yards, or in their homes. Less than 10% of fatalities (so you're talking about 10 people at this point) happened at the jaws of a leashed dog. Most of our dog problems in this country, the UK or anywhere could be solved with a little bit of education. Legislating common sense has never been terribly successful. Please help. I've talked a lot about the Winter Assistance Program and how while out doing the work that a properly staffed animal control department would do they've had several dogs turned over to them when people admitted they couldn't properly care for them.